An active weather pattern will stick with us through Monday before much warmer and drier weather returns for the middle of next week. Overall expecting little impact snow-wise through Monday for the metro area, but we'll watch carefully in case anything changes there. There's not a lot of cold air to work with this time, so much of any precipitation that does fall over the next few days will be in the form of rain at lower elevations. Highs for Denver each of the next three days will be in the lower 50s, with overnight lows near freezing. 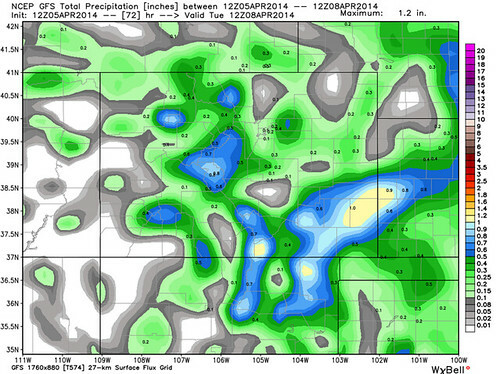 Of the global models, the GFS is the most gung-ho about moisture for Denver, bringing chances of showers today, with a better chances Sunday night into Monday. The GEM is somewhere in between, and EURO is pretty dry through the period. Looking at the hi-res models this morning it looks like best chance for showers this afternoon and evening will be over the Palmer Divide, with a chance for convective snowfall at higher elevations. Denver remains mostly dry Saturday, but cannot rule out a few rain or rain mixed with snow showers spilling into the city. For now will stick with no snowfall accumulation in Denver through Saturday night, with a chance at 0 - 3 slushy inches over the Palmer Divide, with a few more inches possible into the Front Range mountains, especially southwest of Denver. We'll keep an eye on Sunday night but hold off on any snowfall forecast at this time. Analogs would suggest there will at least be a chance for snow from Denver south across eastern Colorado -- but there just not a lot of support for this between the models. The GFS appears to be the wettest of the models (a few spotty tenths late Sunday night across the metro), but even with this solution much of that would be rain. 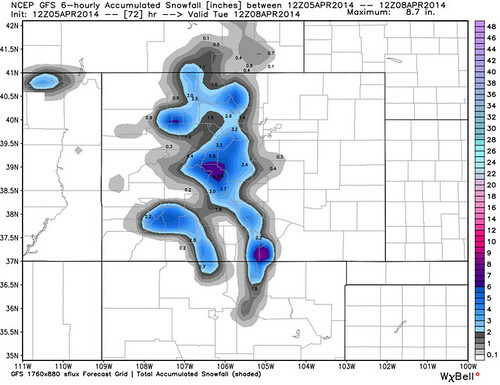 Here's a peek (left) at the 12z GFS accumulated snowfall through Monday for Colorado. Understand this could change as we head through the next 12 hours, and that these snowfall maps don't do particularly well with temperatures this time of year. On the right is total precip through the same period -- notice that it's spotty in nature, especially around the Denver area, also that it tries to bring some much needed moisture to southeast Colorado. We can hope.